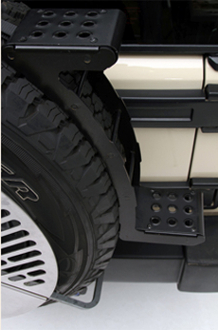 If you are looking for a way to add a utility step to your spare tire, Front Runner has the answer. The utility step attaches to the rear mounted spare wheel / tire using heavy duty black ratchet strap provided. Black powder coated stainless steel frame with non-slip tread plates. No drilling, no tools -- just wrap, ratchet tight, and climb. Fits up to 35” tires. This is the perfect accessory to secure the Camp Fire Cooking Grate to your spare. So why not drop one of those in your shopping cart before you take your next trip?